Fans of the classic game Guess Who? from Milton Bradley can now learn about and celebrate the achievements of famous women around the world. and includes 28 flip-up biography cards with hand-drawn watercolour portraits of famous female athletes, artists, scientists, and astronauts, such as Amelia Earhart, Frida Kahlo, Malala Yousafzai, and Harriet Tubman. In addition to representing a variety of professions, the women also represent different nationalities and ages. Unlike in Guess Who?, players of Who’s She? guess the identities of each face card by asking questions about their accomplishments, as opposed to their appearance. 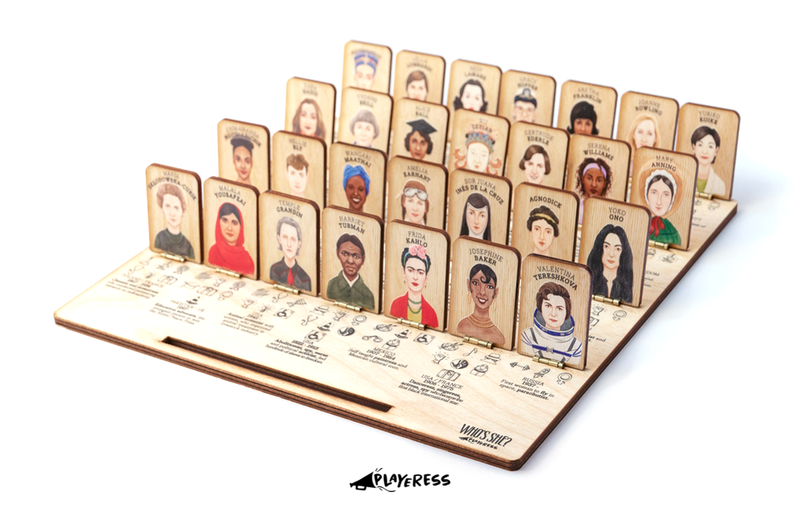 A series of icons printed directly on each game board provide a quick summary of each woman’s background. Playeress also includes 28 biography cards with additional details and anecdotes. A rule book rounds out the package. Who’s She? is available direct from the Playeress online store. It will be available in May 2019 for a price of €75,00. A cardboard version of the game is available now at a much lower price point of €10,00.